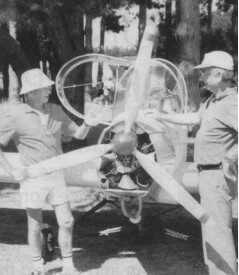 Horn TH-1 ZK-TLH was the result of over forty years of experience in aviation by a Levin, New Zealand, pilot, being a low wing monoplane similar in microlight configuration to the Bobcat. Powered by a two cylinder Koenig radial, the TH-1 was undergoing ground trials in 1989. The single-seat aircraft was built by Tom Horn without plans, and features spoilerons rather than ailerons.